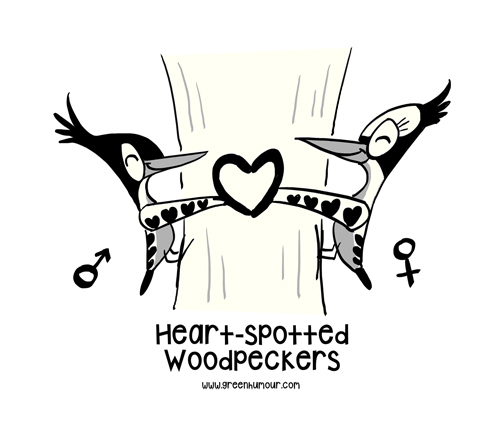 The Heart-spotted Woodpecker is a small woodpecker found in the Western Ghats of India and in South-east Asia, and is simply adorable to look at! They are called so because of the heart-shaped spots on their wings. Here's a pair of 'Hearties', available as prints and merchandise on my webstore here. Orders within India (t-shirts, mugs and posters) can be placed by mailing me on rohanchakcartoonist@gmail.com. Adorable loving little heart.. The female one looks pleased..I like it's cute expression.